This past weekend, Matt and I took a trip to Monterey, CA. It was my first time in Monterey and I loved the little town. After the fog cleared in the morning, we had some awesome views of the water. 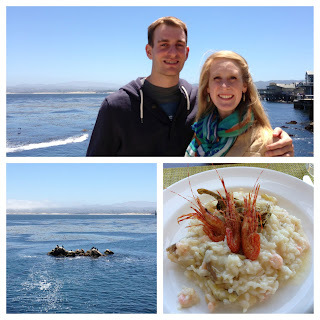 Our first stop in Monterey was at the Aquarium on Cannery Row. After looking at all the cool fish and adorable otters we got lunch at Cindy's Waterfront, a nice restaurant in the aquarium. We were seated facing the water (view on bottom left picture) and given little binoculars so that we could see the otters, birds, and sea lions that were swimming nearby. I ended up ordering a shrimp and artichoke risotto (bottom right). Now, if you know me, I'm a little obsessed with artichokes. This love started last year while I was studying abroad and had artichoke on pizza. I've been in artichoke heaven out in California this summer and this dish was lovely. It had delicious pieces of artichoke hearts in the risotto itself and it was topped with a fried artichoke. Fantastic. If you'll notice on top of the risotto, is some real shrimpys. The risotto was a special on the menu because those particular shrimp were somehow rare. The waiter said that only one fishermen catches this particular kind of shrimp and that they are only 1 of 4 restaurants that serve it in California. Honestly, I didn't understand why they were so special. Yes, they were delicious, but they were pretty small and didn't taste much different from other shrimp. My risotto was a little more expensive because of this "special shrimp" so I'm not sure if I went again I would get it. I guess I'm not a shrimp snob. Overall, the risotto was delicious. The rice was cooked perfectly and I loved the parmesan flavor with the artichokes and shrimp. Matt had an "adult" grilled-cheese that was spicy and very good too. Cindy's was a little pricey for lunch, but considering the amazing views and high quality of food it was definitely worth it if you're visiting the aquarium. -Cindy's is much smaller than their cafeteria so you will need a reservation! -The aquarium gets super crowded so make sure to get there early.